A classic Modern style lido. The 40m pool tank is crescent shaped with an art deco fountain at its northern end. 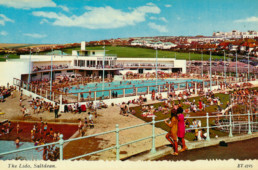 Streamlined poolside buildings flank the crescent: symmetrical curved changing room wings with cantilevered tea terraces above and a cafe rotunda with ice-cream kiosk echoing the bow of an ocean liner. 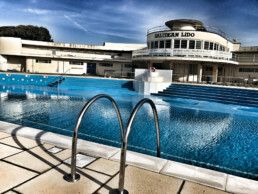 The lido has been saved by local residents who set up a community interest company and successfully secured a 60 year lease of the site and funding to restore and re-open the pool. It is operated by Fusion Lifestyle. The 40m heated pool is now open together with a paddling pool, wet play area and sunbathing lawns. Phase 2 of the project will see the restoration of the buildings to provide a heritage café, community rooms, a library and an art deco ballroom. 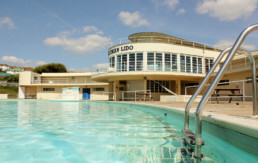 Saltdean Lido is one of only two grade II* listed lidos in the UK. In 2015 Historic England named it as one of England’s seven seaside wonders. Fundraising to progress Phase 2 of the project is the current focus – Heritage Lottery Fund have earmarked £4.2m and Brighton & Hove Council have pledged £700,000. Saltdean Lido CIC need to raise another £2m to begin Phase 2.